Optimal Free T3 changed my life. Could it change yours? According to mainstream medicine, TSH (thyroid stimulating hormone) is the gold standard for the diagnosis and treatment of thyroid dysfunction. Unfortunately TSH alone does not provide a complete picture. Doctors rely on this one blood test, TSH, to make major decisions about our diagnosis and treatment, leaving many patients suffering symptoms. Levothyroxine is a thyroid hormone replacement drug that contains the synthetic form of one thyroid hormone, T4. Levothyroxine is the drug of choice by mainstream doctors for hypothyroidism and Synthroid is the most commonly prescribed brand name. The assumption is that our bodies will convert the T4 hormone in these drugs to the active T3 hormone our bodies need. T3 is the most active useable form of thyroid hormone that can be used in the cells of the body. The conversion of T4 to T3 is a critical element in this puzzle. 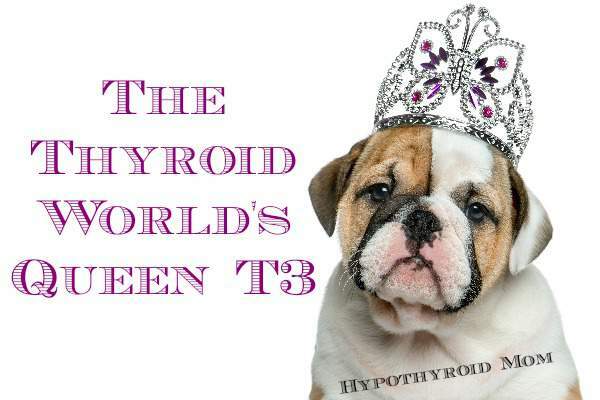 However, for some hypothyroid sufferers like me, our bodies don’t convert T4 to T3 properly. It wasn’t until I changed doctors and my Free T3 was tested and treated with natural desiccated thyroid along with time-release T3 (made by a compounding pharmacy) that I finally felt better and my symptoms improved. Thanks to a great thyroid doctor who knew to test my FREE T3 levels, I got my life back. There are binding proteins that attach to thyroid hormones to transport them like little taxis through the blood vessels to cells all over our bodies. When they reach the cells, only the unbound “free” hormones can actually be used by the cells. Therefore Free T4 and Free T3 levels are important (please note that Free T3 and Free T4 are different than Total T3 and Total T4). Since T3 is the most active useable form of thyroid hormone that can be used in the cells of the body, Free T3 is critically important. Unfortunately mainstream doctors often do NOT test Free T3. I’ve heard from many readers around the world that their doctors refuse to test Free T3 and even though they are suffering terrible symptoms on T4-only thyroid treatment their doctors refuse to consider T3 thyroid medications. This is an absolute tragedy! It’s not enough to hear your doctor tell you your Free T3 is “normal”. Get a copy of your lab results and see where your test results fall relative to the normal reference ranges listed to the right of your scores. 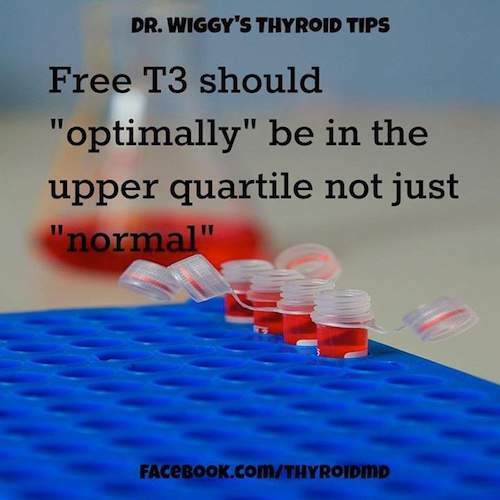 Your Free T3 test result may be “normal” but not “optimal”. There is a big difference. Thyroid advocate Mary Shomon included this great article at About.com Thyroid Disease. Thyroid Patients: Do You Need T3 To Feel Well? What I tell fellow thyroid patients is that in this situation, the first thing you’ll want to think about is whether or not you might benefit from the addition of supplemental T3. …many thyroid experts believe that patients feel best when Free T3 levels are in the top half of the normal range, and even at the 75th percentile and above of the range. Now let’s figure out the math. I have my labs done at Quest Diagnostics. The Free T3 reference range listed is 2.3-4.2 pg/mL. Now different labs use different units of measurement and they also use different ranges, therefore the reference range listed on your lab results may be different. 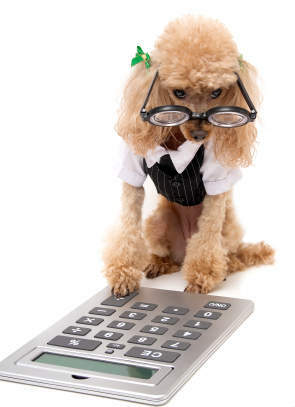 Go by the numbers listed on your lab results sheet to the right of your Free T3 score. How do you calculate the top quarter of the reference range? Let’s see if we can keep this simple. So for the reference range 2.3 -4.2, the top quarter of the reference range is between 3.7 and 4.2. Now you can do the same calculations with whatever numbers are listed as the normal reference range for Free T3 on your lab results. I am on a natural desiccated thyroid brand called Nature-throid that contains both T4 and T3 hormone as well as a compound time-release T3 that is made by a compounding pharmacy. My doctor regularly monitors my thyroid levels including Free T4 and Free T3. When my Free T3 is low or even middle of the normal range, my hypothyroidism symptoms come back and I feel TERRIBLE! I only feel well when my Free T3 is in the top quarter of the normal range. Now we’re all different in terms of what’s right for us, so it’s important to work with your doctor to find the optimal level for you where you feel your best. It’s really about having a doctor who listens to you and your symptoms. My doctor starts off every visit with “How are you feeling? How are your symptoms?” It took months of adjusting my dosage until one day I replied, “WOW I feel great.” It turned out my Free T3 was in the top quarter of the range. I know myself so well now that as soon as my symptoms worsen I know my Free T3 is too low and guess what it always turns out to be true. Different laboratories also use different ranges. Some use broader ranges than others. So again it’s so important to work with your doctor to find where YOU feel your best. We all have to watch ourselves for signs of over-medication and contact our doctor if we experience hyperthyroid symptoms like racing heart, heart palpitations, insomnia, anxiety, sweating, and trembling. We’re all different and it’s about figuring out the optimal level where YOU feel your best. Am I saying that Free T3 is all that matters. Absolutely not. There are many potential variables with thyroid conditions and I’ll be writing more about them here at Hypothyroid Mom. However Free T3 is a critical piece of the puzzle. With a mainstream medical model that focuses on TSH and T4-only medications, it is essential that we be advocates for ourselves to ensure we have proper testing and treatment. At a very minimum thyroid testing should include Free T4, Free T3, Reverse T3, and thyroid antibodies. Get a copy of your lab results and check that you’ve had these tests done. Check where your scores fall relative to the normal ranges listed to the right of your scores. Check your Free T3. Where does it fall relative to the reference range? If you are being treated with thyroid hormone replacement medication but you still don’t feel well, insist on further exploration. If you are still not feeling well, get a second opinion, a third opinion, even ten medical opinions. Keep searching until you find a doctor who does comprehensive testing including Free T3 and explores the treatment options to find what’s right for YOU. I compiled a list of the top 30 resources to help readers find great thyroid doctors in their area. The other option you have is to order YOUR OWN thyroid lab tests without your doctor. Do you know that’s possible?! A trusted online place where you can order lab testing yourself is True Health Labs. They have comprehensive thyroid assessments that include TSH, Free T4, Free T3, Reverse T3, thyroid antibodies and more. The advantage of True Health Labs is that they offer one-on-one results review with one of their Functional Medicine doctors so that you understand your lab test results and next steps. Use coupon code Limited_5 for 5% off an order. Optimal Free T3 changed my life.